Planning healthy meals can be difficult, especially if you are cooking for a family who is stuck in a rut of unhealthy diets. With some basic nutrition knowledge, however, you can have your family eating healthily without them even realizing it. The key to creating healthy-meals is to plan. Plan your week’s meals ahead of time and ensure you have all of the necessary ingredients. Don’t put off preparing healthy diets because you don’t have a tomato! Plan your meals out and go grocery shopping. When you shop and buy your foods, go only for the foods that are on your list and avoid temptation by staying away from the chocolate and ice cream aisles. This will also allow you to keep your food costs to a minimum because you are buying less expensive whole foods instead of processed foods. Huge time savers such as slow cookers and microwaves are also helpful and everything that comes out of the microwave doesn’t have to be unhealthy. 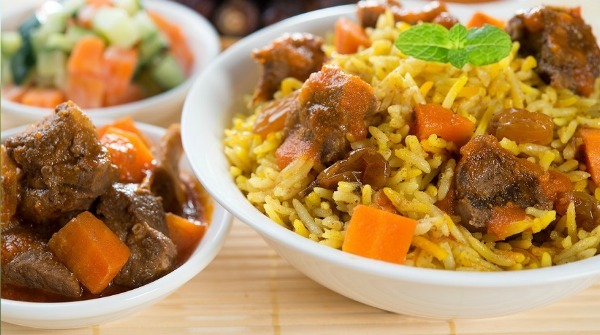 A slow cooker will allow foods to cook all day while you are at work. When you get home, you have a delicious and healthy meal waiting for you. On the weekends you can prepare meals ahead of time and put them in microwave safe dishes. When you have busy nights such as evenings that are full of sports games or activities with your children, all you have to do is pop their healthy meal into the microwave. There are several microwavable healthy-meals that you can make at home and save for the rest of the week. These are also good if you are a single person living alone and find it expensive cooking for just one person. Simply divide up the meals into individual portions for the rest of the week. 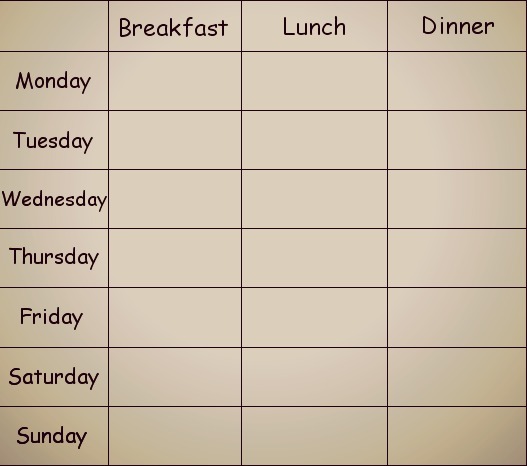 When you are planning meals for the week, create a chart of each day’s meals and your daily schedule. This will help you decide which days are best for certain meals. Below is a good sample chart that you can use! This can save a lot of your time and cost because at times the week is so hectic that you don’t know if you have anything to cook or eat. You can place those special recipes you have been wanting to try on Friday or weekends and then come up with quick healthy alternatives for your busy days. Eating healthily is a family affair. It‘s important to get your partner and your kids involved. This allows you to ensure that everyone has something that is his or her favorite being served at some point during the week. This may mean compromising and allowing less healthy foods to be eaten until your family get used to the new regime. This may mean that Friday nights are special pizza nights, but the rest of the week is healthy. It‘s important to plan meals with everyone’s input to ensure that everyone’s tastes are involved. You also don’t want anyone to feel as though they are being deprived of something they like. Take the effort to find a healthy alternative rather than just crossing something off the menu altogether. It‘s an even better idea to get everyone involved in cooking the healthy meals. This allows the children to learn their way around the kitchen and what foods are healthy for them to eat.